Jul 27 You Think This Is Robbery? "Barack Obama", "Debt Ceiling", "Elections", "white house"
I have said this before and I will repeat it again. The Republican party does not want to increase the debt ceiling without some spending cut. Spending cut that goes against Democratic principles. Spending cut that will hurt the American People. They want to gut out Social Security, Medicare and Medicaid. They want to undo the HCR bill piece by piece. They want to shut down community health care services. They want to take away college grant funding from kids who are attending college. They want to shut down Government facilities so that basic public services are discontinued. They want to take away from the poor. 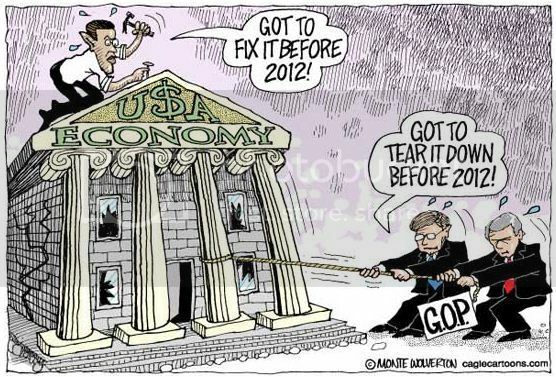 All done in the name of fiscal responsibly but in the great scheme of things, it is political and it is to make Barack Obama a one-term President while aiding the economy to tank. ...and progressives call the effort by President Obama to negotiate with a Republican majority in a "balanced approach" which includes spending cuts and new tax revenues to reduce our nations debt a Robbery. I disagree! No, the balanced approach does not Make Ordinary Robbery Look Respectable but allows our Government to continue to function. No, the Balanced approach is not Robbery. The balanced approach is a way to get things moving along so that the country we love so much is not going into bankruptcy. No, the President's Balanced approach is not robbery. It intended to avoid the "treasury from being forced to default on its legal obligation of the United States causing catastrophic damage to the economy" (more harmful than the financial crisis). No, the President's Balanced approach is not robbery. It intended to avoid what a default would impose, like increased in substantial tax on all Americans not to mention an increase interest rate in Government, Corporate and Consumer borrowing. No, the President's Balanced approach is not robbery. It is trying to stop a discontinuance of payments to U.S. Military salaries and retirement benefits, Social Security and Medicare benefits, Veterans' benefits, Federal Civil Service Salaries and Retirement benefits, Unemployment benefits to states, Interest and Principle payment on Treasury Bonds and other securities; Student Loans payments, Medicaid payments to states, and payments necessary to keep government facilities open among the many US obligations at stake. No, the President's Balanced approach is not robbery. It is an approach that is trying to ensure equity prices, home values and retirement accounts do not decline. No, the President's Balanced approach is not robbery. It is an approach that will allow business to continue to make new investments and spend to spur the economy. No, the President's Balanced approach is not robbery. It is trying to ensure a significant level of job are not lost because of the potential decline in investment halting our Economic recovery. No, the President's approach is everything to do with trying to save America but robbery. The Republicans will never afford this President any thing that can remotely help him political standing as other Presidents have been afforded in the past. In the eyes of Republicans, rejecting the debt ceiling is suppose to do the "single most important political goal" of the Republicans and that is Making Obama A One-Term President Is My Single Most Important Political Goal. What distinguishes a good leader from the pack is the ability to come up with solutions to difficult problems and the President is doing exactly that against all forces from the Right. And No, Democrats did not forget that they were supposed to protect these 'entitlement' programs like SS, Medicare and Medicaid. Republicans however have. Republicans, we the people elected in the mid-term elections or allowed to win because of Democrats inaction, have given them the power to draw the agenda. Tell me how you are going to fix the stalemate. What plan do those of you who are not for the "balanced approach" have to offer to make the Republicans do what you want them to do? How do you make the republicans say you have a deal to pass a bill in Congress? After all, they have the majority. Sometimes hard decisions have to be made to move the country in the right direction and somebody has to do it and some people don't like it. That is our political system. If we don't want to see such a gridlock, we better work harder to elect more and better democrats so that our hands are not tied behind our back and complain about what should have been done because personally I see the progresses we have made as a building block to move forward while some folks see it as a failure. May be the answer is for "President Obama to invoke the 14th Amendment to the Constitution as a 'failsafe' mechanism to increase the federal borrowing limit unilaterally." Jul 28 Stephen Marche: "How Can We Not Love Obama? Because Like It or Not, He Is All Of Us"
Aug 1 Organized Circular Firing Squad: Stop Spinning. No Mission Accomplished Banner Nor Deceiption Here. Jul 26 Same Old $hit From the Same Old Crowd. The Scolding Of The President As Usual And Aiding Republicans.